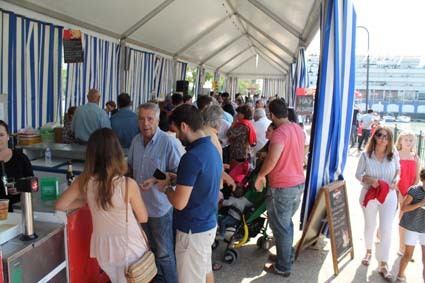 Anto the organizers, City Hall and Port Gelves, as the exhibitors of RÍO Y SABOR 2016, are very satisfied with the results achieved in the II GASTRONOMIC FAIR OF THE RIVER AND THE SEA, held last weekend at the marina. The mayor of Gelves, Isabel Herrera, says that "it is a young fair that has to continue growing in future editions, but has far exceeded our objectives of tourism promotion and gastronomy of the area." Herrera claims to be very happy with the results of both public and quality and level of the dishes offered by the stands inside and outside the locality, which have shaped the gastronomic offer this second edition. Even the weather has accompanied showing the best image of the port and the Guadalquivir River, which is still one of the main objectives of the exhibition, framed within the project "Territorio Guadalquivir" promoted by Prodetur, its main sponsor. There have been 5 bars and restaurants present in this second edition, three from Gelves, one from Coria del Rio and another from Olivares, the ones in charge of showing their best culinary compositions for the occasion, delighting their visitors. The public of Rio y Sabor 2016 has been able to taste more than 50 tapas and different dishes, all elaborated with products of the river, the sea and the riverine orchard. Two of these establishments, "Sevruga Restaurant" and "Asador Rincón de Manolo" have been the deserving of the prizes awarded by the organization to the Best Cover and Best Fair Charter respectively. Specifically the best tapa has been "Albur a la plancha with lemon potato and galician garlic", while the award-winning menu included among its varieties "Brochette of scallops and prawns with flavored carrot cream" or "Cod loin with shrimp sauce And salmon ", among others. As for the parallel activities, they have also enjoyed good acceptance by the public, especially those focused on the smallest, hichable castle, themed gymkana, children's workshops and storytelling. In addition, it is worth mentioning the tasting of paella at noon on Saturday, in which many establishments of Gelves collaborated in addition to the Agrupación de los Dolores, the talk-tasting mojito, and the contests of Miss and Mister Guadalquivir on Saturday night. Do not forget also the performances offered by Alejandro Bejarano, The Megatones or Alexis Larios, among many other activities.